Andamans is undoubtedly one of the most exotic islands in the Indian sub-continent where Mother Nature invites you to bask in its glory far away from the concrete jungles of mainland India. Andaman Islands form an archipelago in the Bay of Bengal and have been inhabited by the Jarawa tribe for almost thousand years. Stretching almost 700 miles, the Union Territory of Andaman & Nicobar Islands is scarcely populated and you get to experience nature in abundance. During your Andaman tour the panoramic landscape and blue sea waters of Andamans will cast a mesmerizing spell as you simply cannot stop admiring its calm and isolation. The marine life and flora and fauna of the region are a delight for wildlife lovers who visit the island every year from around the world. Diving in Andamans is an integral part of Andaman adventure as the island offers some of the best opportunities for Scuba Diving in India. Water sports lovers can enjoy scuba diving at Havelock Islands, a tropical island of about 55 square miles situated three hours away north-east of Port Blair. 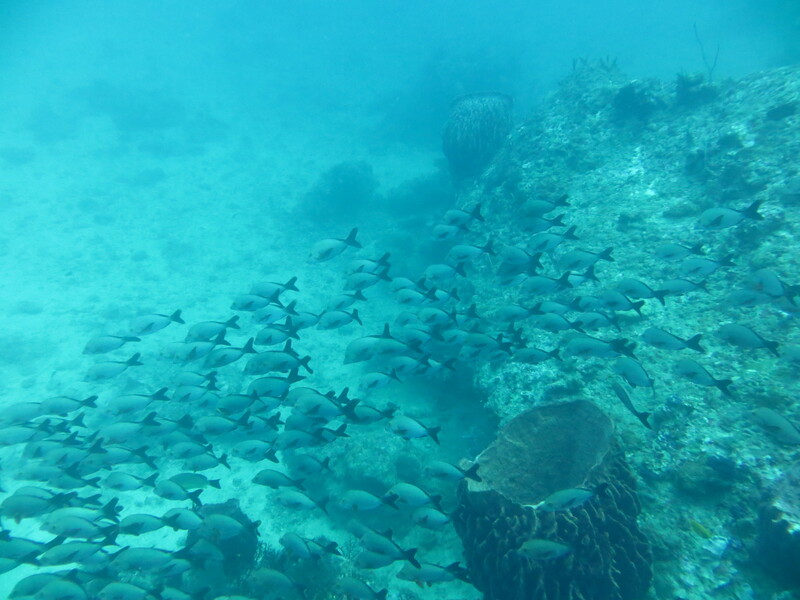 The island offers recreational and professional diving opportunities for all level of divers. Discover the vibrant & colourful temples of India's South. 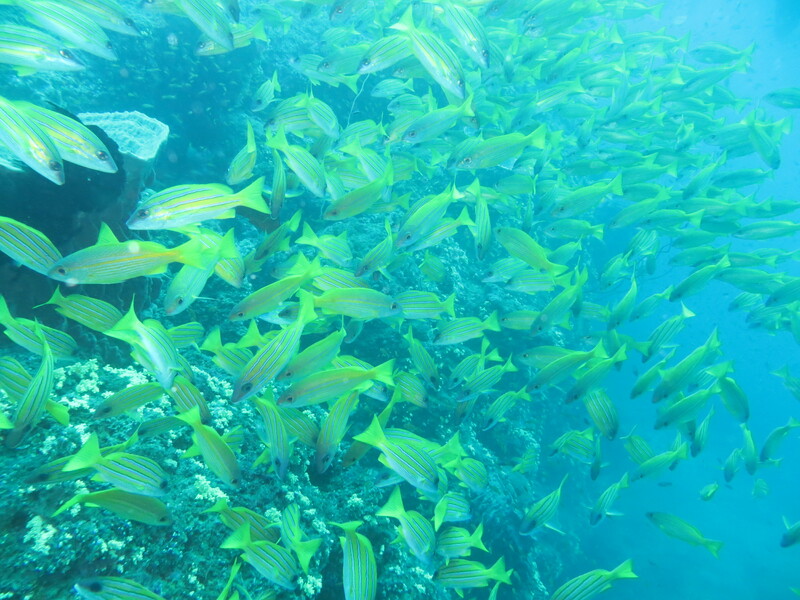 Enjoy the scuba diving sessions on the gorgeous Havelock Island. Upon arrival at Chennai in the evening, you are escorted to the hotel where you will be welcomed in a traditional south Indian style. Overnight stay is at hotel. Situated on Coromandel Coast, off the Bay of Bengal, Chennai the capital of Tamil Nadu has shaped up as one of the biggest commercial and industrial hub of South India. Chennai has played a prominent role in upholding the historical and cultural heritage of India by preserving the architecture and promoting the traditional music and classical dance forms. Chennai’s gradual transition from a conservative city to a cosmopolitan becomes apparent as you explore the city which has centuries old temples and churches on one side and swanky multiplexes, shopping malls and corporate offices on the other. Chennai is also the hub of South Indian film industry which produces highest number of movies every year compared to anywhere in the world. Also known as the ‘Detroit of India’, Chennai is home to major auto makers from around the world who have set up their production plants in the suburbs of Chennai. After breakfast at the hotel, we leave for Chennai sightseeing. The city served as the economic and political capital of the East India Company from the 17th century onwards. Among the highlights of the city is Fort St George that marks the beginning of Chennai as an important centre for trade. Within the fort is St Mary’s Church, the first English church in India and the oldest British building to survive. 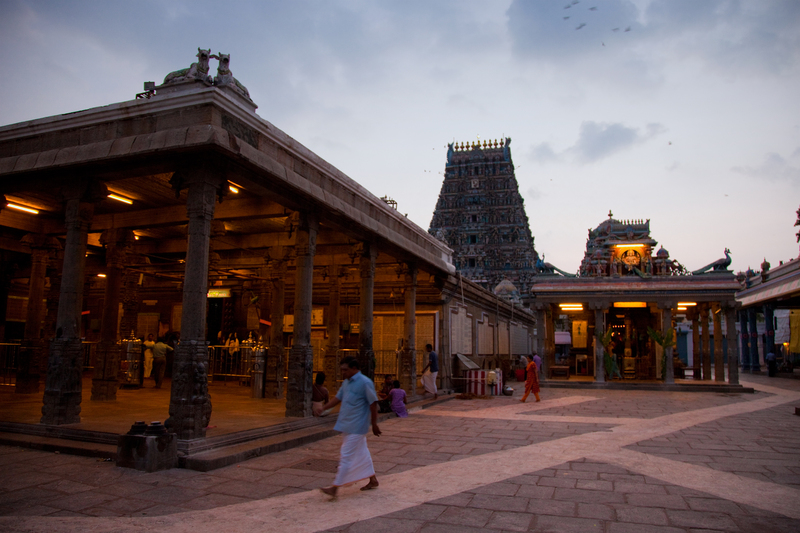 We will spend sometime in the Mylapore temple area to visit the 16th century Kapaleeswarar temple. Afternoon is at leisure. Overnight stay is at the hotel. Situated on Coromandel Coast, off the Bay of Bengal, Chennai the capital of Tamil Nadu has shaped up as one of the biggest commercial and industrial hub of South India. This experience takes you through Georgetown, the historical neighborhood of Chennai known for its colorful spice and textile market where you can experience shopping in South India through exotic herbs grown in Indian sub-continent and ethnic South Indian dresses. With Vasco as your travel agency in South India, you also get a chance to mingle with local shopkeepers and order your choice of herbs. Our experienced guide on this South India cultural tour will walk you through the bazaar explaining you about the mythology and finer nuances of South Indian culture. The bustling wholesale marketplace is perfect for your shopping tour and is a meeting point of trading communities where traders from all over India come to order their choice of goods. Wholesalers have stocked a large variety of products which can be legally sold and bought at attractive wholesale prices. From products of daily use like dusters, buckets and screwdrivers to exotic stuff like assorted nuts, peacock feathers and aromatic spices, everything is sold under one roof in Georgetown wholesale market and can be tailor made as per the customers requirements. Our South India tour travel escorts will enlighten you about the glorious past of Chennai as you walk through these lanes, where history, mythology and folklore have blended perfectly to offer you a sneak peek into the present day India. Experience the old world charm and modern day living of Chennai while traversing through crowded markets, narrow lanes and chaotic traffic on one side and majestic corporate complexes and shopping malls on the other. One of the preferred experiences by the westerners, Peacock Trail in is a heritage walk which takes you through Mylapore, one of the oldest areas in Chennai. 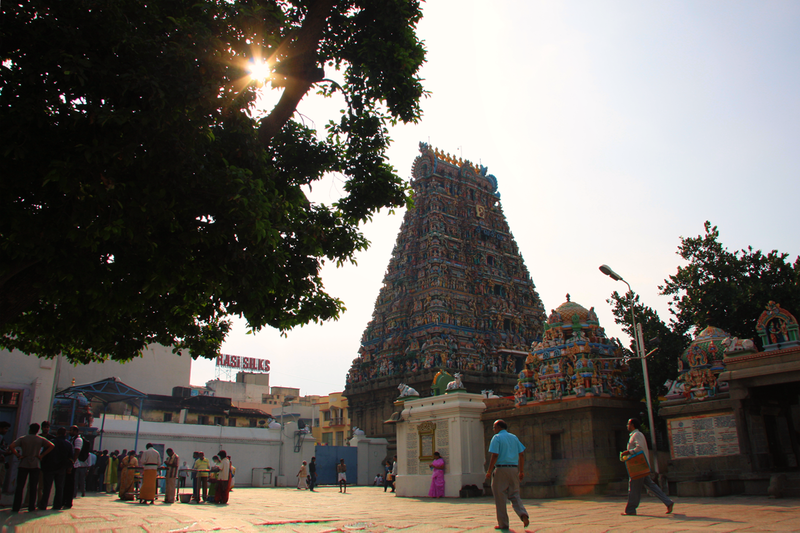 Known for its tree-lined avenues and rich history, Mylapore lies a few kilometers to the south of Chennai. 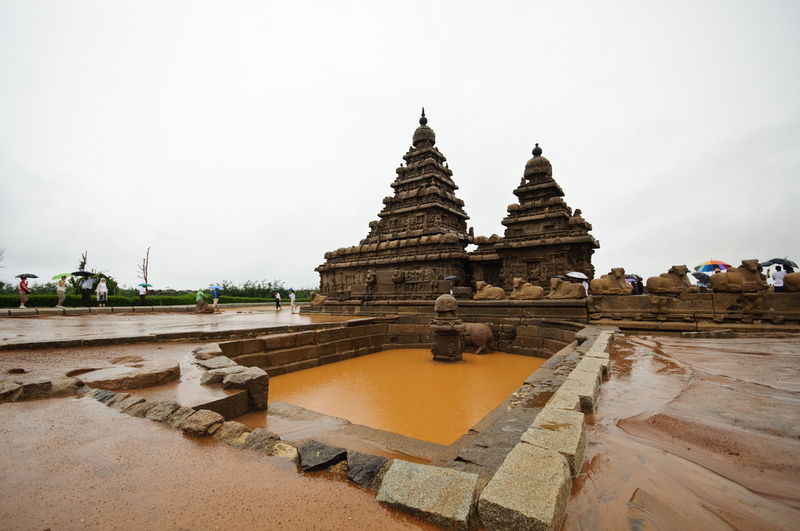 You get to experience the many facets of South Indian culture as you walk past the centuries old temples and churches. Our experienced guide for the trail will take you through the historic by lanes of the fascinating township of Mylapore which was home to a great inspirational poet Tiruvallavur. Referred to as the land of peacocks, Mylapore came into existence 2000 years ago and was an important trading port for silk, cotton, pearls, ivory, teak, sandalwood, spices and precious stones. The starting point of the trail is a visit to Kapaleeshwarar Temple, a 300 old year place of worship with numerous shrines and statues of Lord Shiva and Goddess Parvati. There are many shops around the temple where you can shop for South Indian handicrafts and textiles. The stories from Hindu mythology come alive as you visit the city temples of Mylapore and watch the religious practices and rituals. The enthusiasm with which our guides narrate the stories makes the experience surreal and serves as a wonderful opportunity to get answers to many questions about Hindu mythology. The detailed explanation of the past and a touch of humor accentuate the overall mystic experience as the same story is told in many different ways. Looking for art and craft tourism in India? This experience takes you through Dakshinachitra Museum, a center for the living traditions of Indian culture, art, folk performing arts, craft and architecture with an emphasis on the traditions of South India. Located on the east coast road at Muttukadu – 21 km south of Chennai, Dakshinachitra Museum is an attempt to preserve some of the traditional south Indian ways of life by constructing a ‘Living Village’ that houses some of the famous handicraft items in India with various traditional homes. Dakshinachitra Museum also operates a fair trade Craft Shop with crafts purchased directly from artisans and NGOs. Ethnic Indian handicrafts, textiles, jewelry and other gifts are available at the craft shop. In this India heritage tour, visitors are taken around the museum to meet the residents of heritage homes, learn art & craft activities, play traditional games and view exhibitions that explain some of the rich traditions of South India. This trail gives you an opportunity to take a closer look at varied south Indian art & craft. While on a leisurely stroll through Dakshinachitra, you cannot stop admiring the intricately carved entranceways, statues of gods and goddesses and traditionally painted murals on the walls of the complex are bound to catch your fancy. The low slung heritage houses in the form of wooden dwellings are a treasure trove of stories and every door and courtyard has a tale to tell. Simply South Trail offers fascinating insights into life of South India which is a hub of ancient Indian art and conservative traditions which are still deep rooted in the natives in spite of onslaught of modernization. This experience offers you an insight into Indian classical dance forms of the South performed by expert dancers of Chennai and other parts of Tamil Nadu. Enjoy this part of South India cultural travel as the trail takes you through a journey of dance saga and you watch the fascinating Bharatnatyam performances which can be seen in most of the movies and are an integral part of Tamil cinema. The Indian classical music and high energy performances of the dancers will astound you and you cannot stop admiring the dance moves and skills of the trained musicians. The choreographer will be happy to teach you the elementary steps of popular classical dances of South India and help you to figure out the story being depicted by hand gestures. He will also explain you in detail the origin of the dance forms and tell you about the related controversial stories and their impact on the culture. Dances forms of South India are the most expressive way of telling a story and their pictorial representation can be seen in sculptures and temple walls all over the state. The dance institutes of Chennai are represented by some of the most talented actresses of Tamil cinema who frequent these institutions to learn the dance moves and share their experiences with the young students who want to excel in the field. Experience the thrill of figuring out the stories veiled by the subtlety of the dancer’s gestures and feel the pulse of the music as you become part of this breathtaking extravaganza. Enjoy the rural experience as country roads of Chennai take you across the city’s rural belt amidst the Nilgiris where nature has bestowed its benevolence in abundance. Lush green paddy fields are always gleaming with the rows of coconut trees lined around them making it a picture perfect setting for unwinding in the nature’s lap. Blue skies and gentle, light breeze blowing across the fields get you in high spirits and you cannot stop admiring the beauty of the countryside which looks like a landscape by an inspired painter. The trail takes you past ancient temples and sacred groves which are communally protected and have a significant religious connotation. Tourists and travellers learn the techniques of organic farming in paddy fields and are guest at the house of a farmer who will floor you with his warm hospitality and simple lifestyle. Laze around near the village pond admiring the sights and sound of nature far away from the maddening rush of cities and enjoy a curry meal of rice and lentil cooked in South Indian style, served on a tray of leaves. Give your lungs a new lease of life with a breath of fresh air and rejuvenate your senses as you walk across the green fields of the fascinating landscape of Tamil Nadu. Spend a day discovering the charms of Chennai countryside and experience the joys of rustic lifestyle that is devoid of any evils of the modern day world. After breakfast, leave for an excursion to Kanchipuram, one of Hinduism's seven most sacred cities. This "Golden City of a Thousand Temples" has only around 70 temples of the original 1000 temples and the most famous one of them is Kailasanatha Temple. 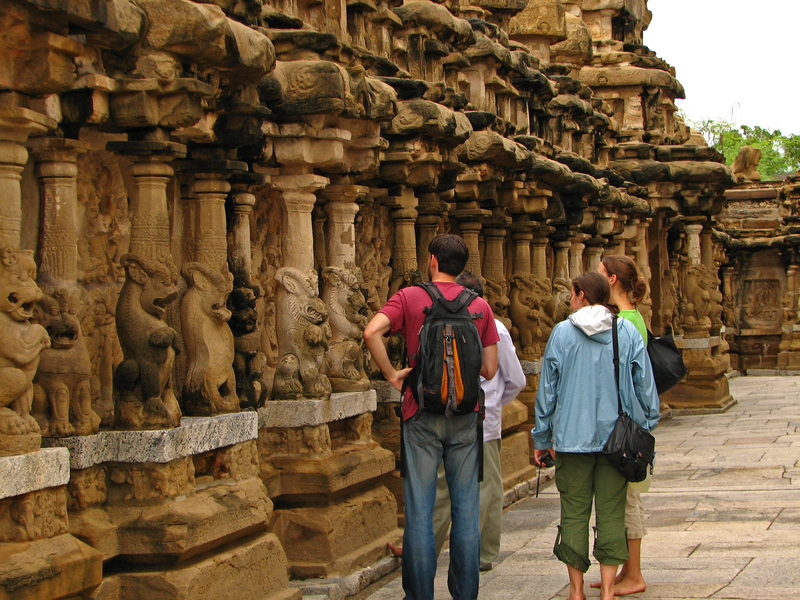 Built with sandstone in the early seventh century A.D., Kanchipuram is also known for silk weaving. A visit to nearby villages to see the craftsmen at work on their looms is a rewarding experience. 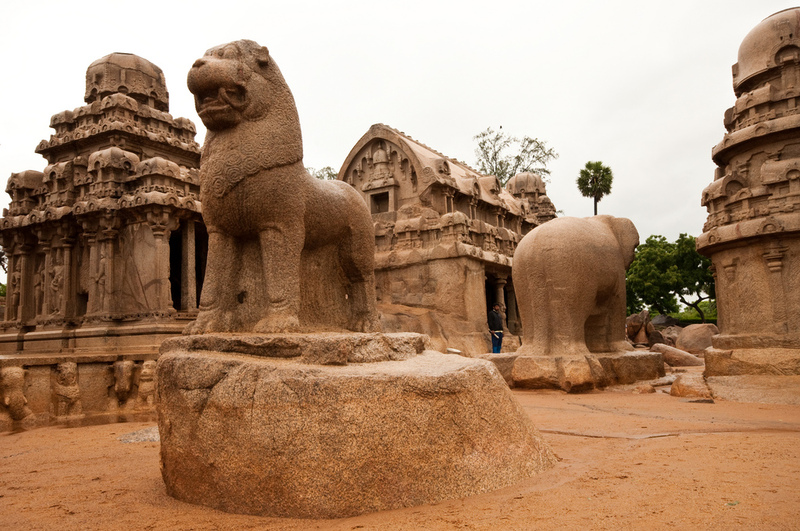 Afterwards we continue on to Mamallapuram (Mahabalipuram) to visit the seventh century rock hewn monuments. 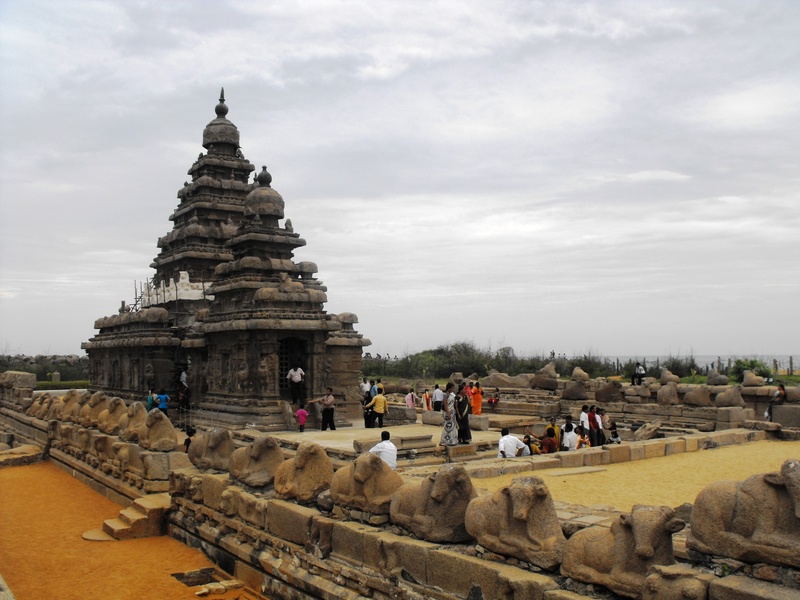 The Shore temple, a World Heritage Monument, is a unique example of a temple built of rock quarried elsewhere and carried to shore. We also visit the Panch Rathas, set of monolithic rock temples located on a sandy compound. They are the perfect examples of the evolution of Dravidian style architecture. In the evening return to hotel for overnight stay. A different tourism experience lies in Steeple Chase. The high point of this trail is a visit to the National Shrine of Saint Thomas Basilica in Mylapore, which is considered to be one of the most important churches in Chennai constructed in the 16th century by Portuguese over the supposed tomb of St Thomas, an apostle of Jesus. In 1893, it was rebuilt as a church with the status of a cathedral by the British. A pilgrimage center for Christians in India, the Basilica commemorates the site where St. Thomas, one of the 12 apostles, was martyred in 72 A.D. The cathedral is a neo-gothic splendor and is the principal church of the Roman Archdiocese of Chennai. 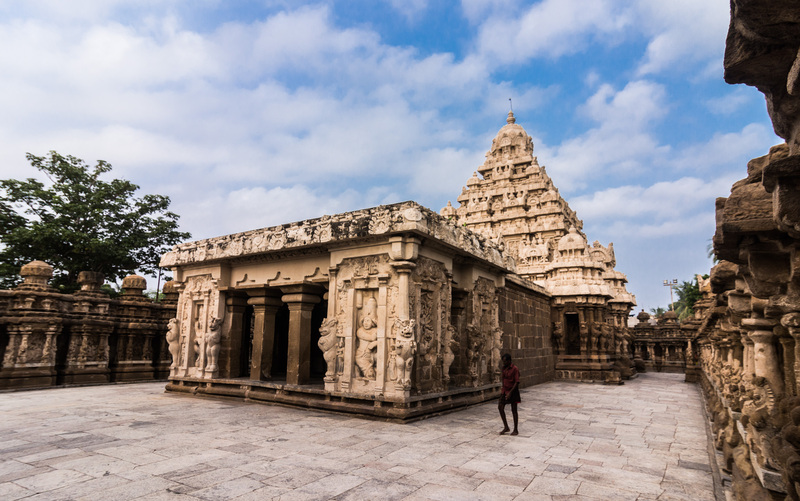 The experienced guide will take you through Chennai’s Christian history from the time St. Thomas arrived in the beautiful beach town of Mylapore to the era of British colonial rulers who left behind a marvel of architecture. Indian mysticism has intrigued the westerners for centuries as they cannot resist coming to India in search of transcendental experiences through Indian spirituality. The Mystic Trail takes you on a quest to find answers to complex questions which remain unanswered by the western world. You get a chance to understand the centuries old Indian mythology and beliefs which form the very basis of Indian civilization. Meet the clairvoyant on the street who will mesmerize you by foretelling your future with the help of a trained parrot and visit the home of a renowned Brahmin (upper caste religious man) who will enchant you by drawing your birth chart which will tell almost everything about your past and future. British Empire in south India flourished with the occupation of coastal belt during the 16th century. British created the Madras Presidency which covered most of south India directly administered by the British Raj and divided the rest into a number of dependent princely states. This trail takes you through colonial Madras (Chennai) where you find British era buildings that have stood the test of umpteen revolutions and are a marvel of British architecture. The majestic Greek columns and domes of the exterior façade and interiors of the buildings tell stories of the grandeur of the Raj. Discovering colonial Madras through the British Blueprints Trail is an experience that gives a whole new dimension to the history of modern India. The best way to discover south India is through the belly by savoring its spices which are exported worldwide for their excellent quality and aroma. Our experienced guide takes you on a spice trail through spice markets of Chennai where the fragrance of commonly used spices like cardamom, coriander, turmeric, ginger, tamarind and asafetida will motivate you to savor the south Indian delicacies cooked with the help of these spices. The flavor and aroma of spices is sure to tickle your palate and you cannot resist ordering a pack for your kitchen. The trail also gives you an opportunity to mingle with a south Indian family who would be willing to teach you how to cook a spicy south Indian meal. Their warm hospitality is reflected in the sumptuous food served to the guests who cannot resist asking for more. Join the spice trail and explore the culinary delights while traversing through the coastal belt of south India. Jewellery in India is not merely ornamental. It is an integral part of Indian attire and reflects the marital and economic status of Indian women who love being decked up with ethnic jewellery. Indian weddings are incomplete without gifting jewellery to the bride who takes pride in showcasing the jewellery collection which is an important asset of every household. On major religious occasions and festivals, gifting jewellery is considered auspicious and people from across the country come down to south Indian cities of Tamil Nadu and Kerala to buy gold and diamond jewellery which increases their net worth many fold. Investment in gold is still considered to be a safe bet by majority of Indian families. The South India Jewels Tourism takes you to the jewellery shops of Chennai and homes of the artisans where gems and ornaments are hand crafted traditionally since centuries to turn them into a piece of art. Our trail guide explains you the idea about South India jewellery in detail along with the craft of designing the while you watch the craftsmen working tirelessly to create magic with the jewels. Explore the many facets of jewellery making and take the India jewellery collection tour for your family and friends who will never forget you for these wonderful mementoes from South India. After breakfast at the hotel, drive to Chennai airport to board your morning flight to Port Blair. Upon arrival you will be received by a Vasco representative at the Port blair airport and escorted to the Ferry point. From here you will take the ferry to reach Havelock Island. Upon arrival at Havelock, check-in at the hotel and rest of the day is free for independent activities. Overnight stay is at the hotel. After breakfast we leave for the diving site to enjoy the underwater sports and activities and come back before lunch. Post lunch we again for diving. This schedule will be followed for the next four days. Overnights will be spent at the hotel in Havelock. After breakfast at the hotel, we drive to Ferry point. From here you will take the ferry to reach Port blair. After disembarking from the ferry at the jetty, you will be received by a Vasco representative and escorted to the hotel for check in. Overnight stay is at the hotel. After breakfast at the hotel, drive to Port Blair airport to board your afternoon flight to Chennai. At the airport you will be assisted by a Vasco representative and transferred to the International airport to board your flight back home.